Nutrition labels on food packets and calories on menus have been largely unsuccessful in stemming the tide of obesity and excess weight in populations around the world. The glaring fact is that most people don't understand the labels or the message they are trying to convey. Most people don't understand calories and the idea of a daily calorie allowance. The food industry has fought against the really meaningful labels such as the red, orange and green traffic lights system. The traffic lights system uses red labels for foods that are high in fat, sugar and salt, and green labels on healthy options. It has been used in a voluntarily in the UK, but its compulsory adoption has been blocked in the UK, Europe, USA and Australia. This article presents a new approach using a fuel gauge concept and graphic symbols to show how much the food or meal contributes to the total daily calorie allowance for men, women and children. Posting of calories on menus has been adopted in the USA, but research has shown that these labels have very little effect on what customers buy. For 13 months, researchers compared food choices in areas that had calories on menus with those in areas nearby where labels were not required. The study found no significant difference and this has been the outcome of similar research elsewhere. The fundamental problem is that most people don't understand the concept of a daily calorie allowance and what value applies to them. Another study found that only one in six people (15%) used the calorie information when deciding what to buy. These 15% bought meals with about 100 fewer calories, but the overall response rate was very poor. See: Q&A Calorie Counts on Menus: Are they Accurate, Understood, Effective, Worthwhile? A major review study of the causes of obesity, published in The Lancet, found that the most likely cause is passive overeating. People eat too many calories because they are unaware of the high calorie content of the rich foods available to them. Overeating is simply a normal response to the high calorie and low exercise environment in which we live. 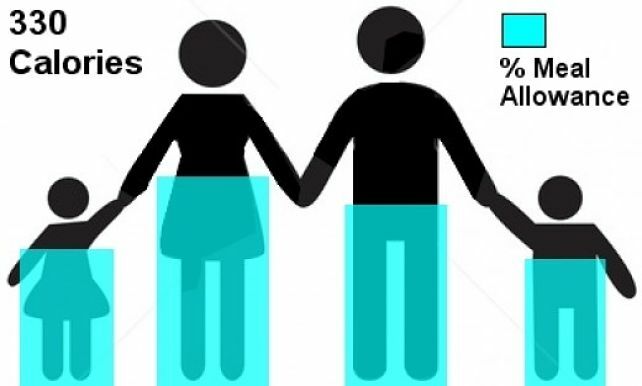 Other studies have shown that virtually every adult in the population puts on weight each year. 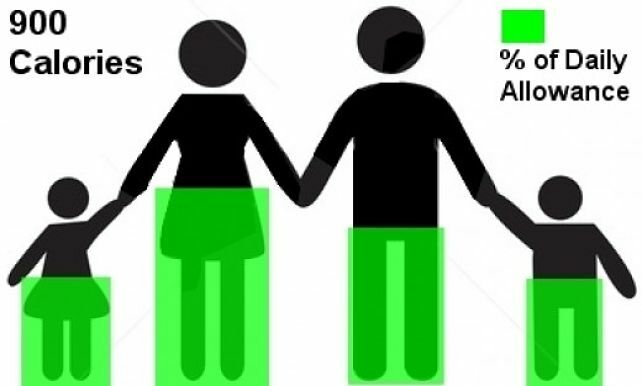 The mean annual weight gain is about 390g in men and 400g in women, and this increase appears to be inevitable and is unaffected by regular exercise. The Lancet Report suggested that to reverse the trend towards obesity everyone in the population should reduce their calorie intake. For the average period the reduction should be about 250 calories per day and 500 calories per day for obese people with a BMI of 35 or greater. But how can this message be adopted when people don't understand calories and the concept of a daily calorie allowance? One of the problems with overeating and over-consumption of calories is fast foods and snacking. It is not widely known, that consuming standard fast food servings such as a burger can add up to more than half of your daily calorie allowance. Add fries, a soft drink, or a dessert and shake, and this could lift the total calories up to your full daily quota, even if it's only a snack or a quick lunchtime meal! It's the total calories in your daily diet that is the most dangerous and insidious. Liquid calories are often the ones most people overlook - the shakes and sodas. You can easily consume too many calories simply by eating too much bread or pasta or otherwise healthy foods. 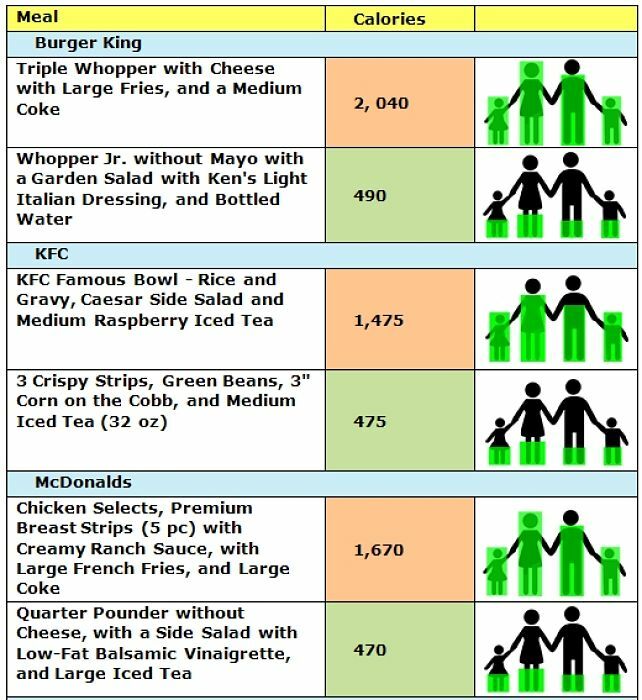 The only way to keep within the daily allowance and knowing what choices to make for each meal, particularly at fast food restaurants is to know the calories in each food serving and meal..
Calories add up no matter what food you eat, but your diet also matters. When you consume a gram of carbohydrate, it contains to 4 calories. But a gram of fat contains 9 calories. more than twice as much. Eating 100g (3.5oz) of fried potato chips (fries) is equivalent to eating 190 calories, which is twice as much as 100g of plain boiled potatoes. It is possible to still enjoy fast food and stay healthy? You simply need to keep track of the calories eaten for lunch at KFC, for example, and eat a smaller meal for dinner to compensate. Otherwise you can be careful to only eat the healthy choice options and not upsize your meal options. But how can you make these choices when you don't know the calories contained in the food as a proportion of your daily allowance? In this article I put forward a simple graphic way of displaying the calorie contents of meals and foods as a percentage of the daily calorie allowance. 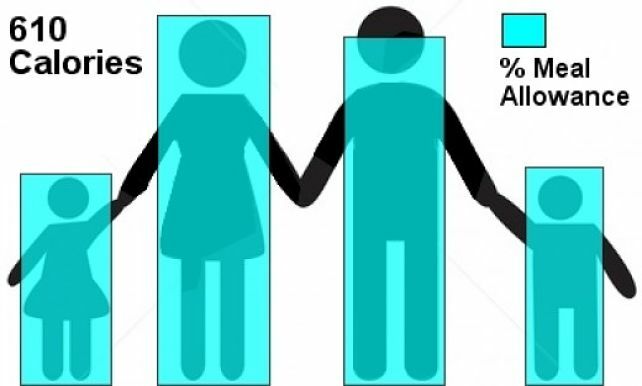 The method uses a simply transparent bar superimposed over and image of a man a women and children. The height of the bar as a proportion of the height of each image shows how much of the daily calorie allowance is contained in the food or meal. 2000 calories equates to the total daily allowance for women and exceeds the allowance for children. It is 75% of the total daily allowance for males. A Burger King Triple Whopper with Cheese, Large Fries, and a Medium Coke has 2040 calories. 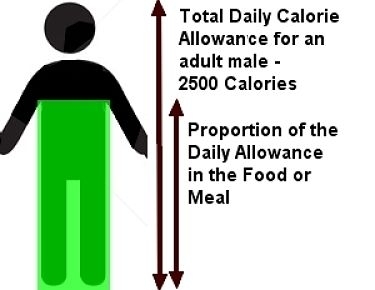 1500 Calories calories equates to 80% of the daily allowance for children, 75 % of the allowance for women and is about 60% of the total daily allowance for males. 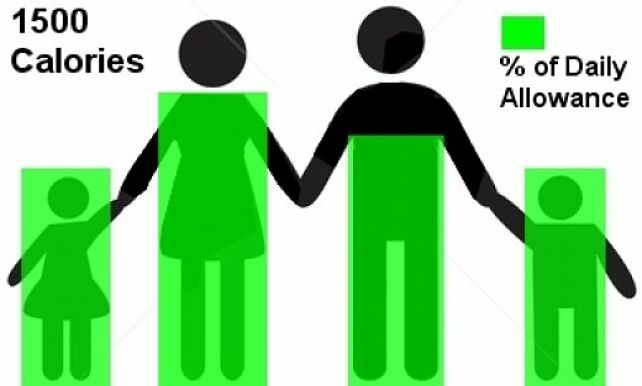 900 calories represents about half the daily allowance for children (1800 calories), 45% of the allowance for women and 36% for an average adult male. 600 calories represents about 30% of the daily allowance for children (1800 calories), 35 % of the allowance for women (2000 calories) and 24% of the adult male allowance (2500 calories). 300 calories represents about 17% of the daily allowance for children (1800 calories), 15 % of the allowance for women (2000 calories) and 12% of the adult male allowance (2500 calories). This is a modified Gauge to show how individual dishes contribute calories for the allowance for the meal (breakfast, lunch or dinner - each one third of daily calorie allowance). This allows the calorie content of the individual dishes to be assessed against the calorie target for one meal. It teaches people to choose dishes and combinations that don't have excessive calories. 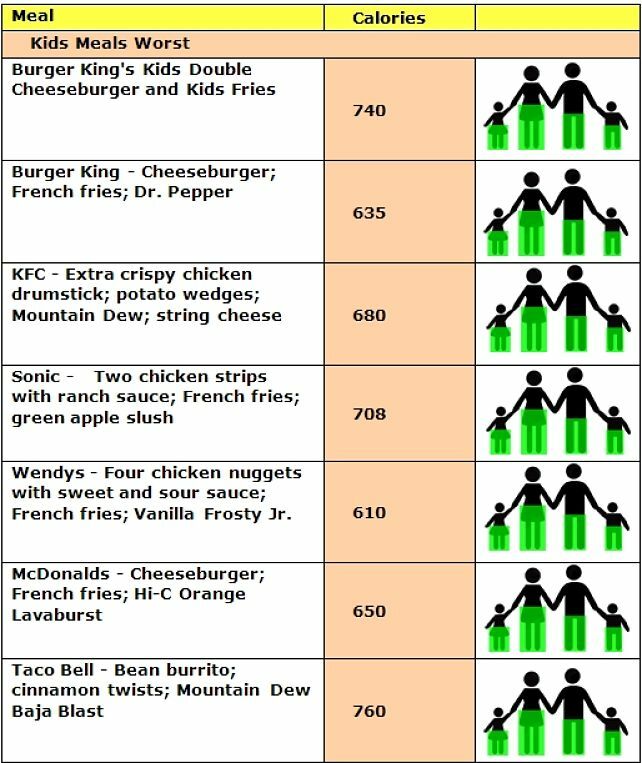 Average single meal allowance is 833 calories for a male; 666 calories for a woman and 600 calories for a child. This is the number of calories in a standard McDonalds Cheeseburger. 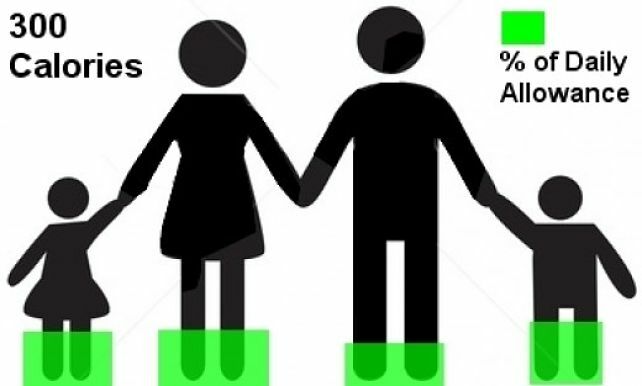 This is about 50% of the calories allotted to a woman for each meal, 40% of the male allowance and 55% of a child's allowance. This is about 65% of the calories allotted to a woman for each meal, 50% of the male allowance and 70% of a child's allowance. 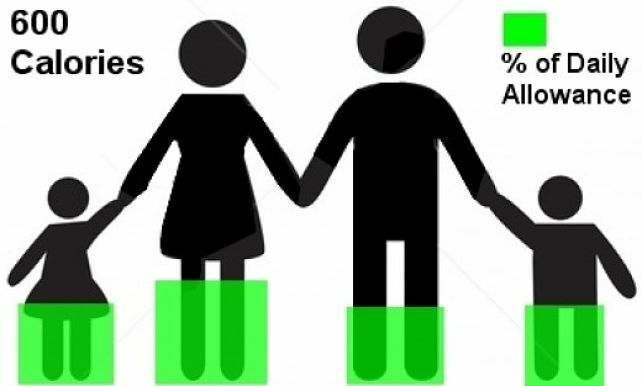 This is about 100% of the calories allotted to a woman for each meal, 80% of the male allowance and 100% of a child's allowance. Clearly eating these fried potato chips is equivalent to the total amount of calories allotted for a meal. The symbols are an easy way to see how much a given dish or meal contributes to the total allowance. Shown below are examples of how this information could be displayed on a menu. 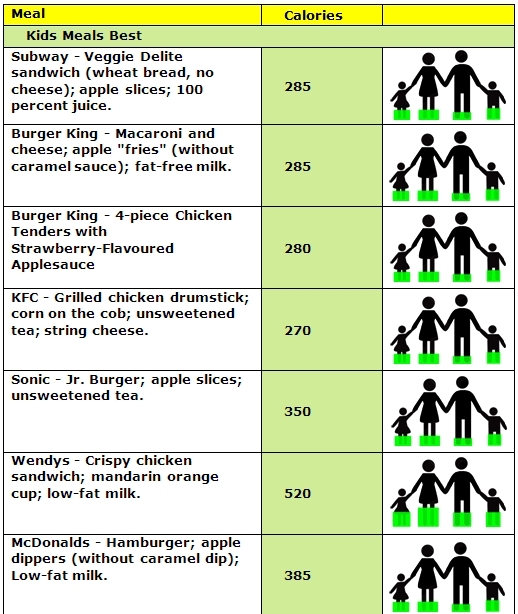 The examples include the highest calorie option (shown in red) for each of the major fat food outlets and a healthy low calorie alternative (shown in green). 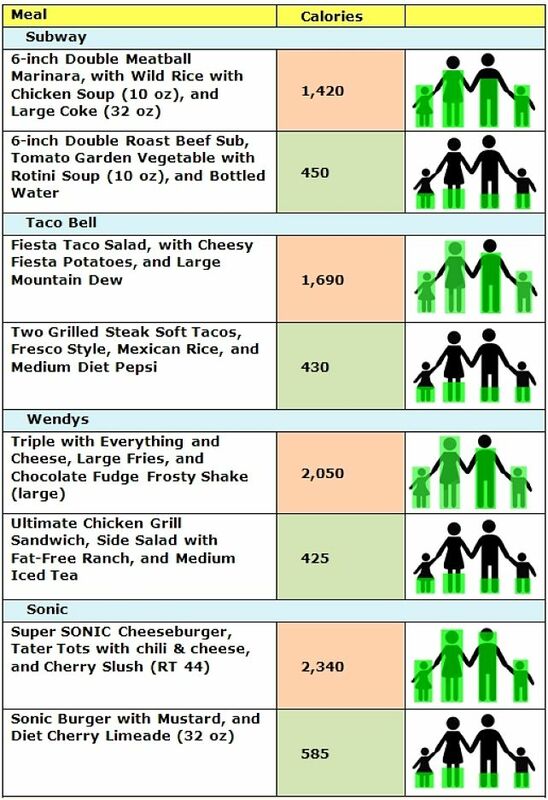 Also shown are some of the worst examples of high calorie kids meals and some of the low calorie alternatives. => Q&A Calorie Counts on Menus: Are they Accurate, Understood, Effective, Worthwhile? => Healthy Fast Food Choices at Restaurants - Purely a Marketing Ploy?